Dogs can often have exquisitely honed survival skills that have been proven successful when there are opportunities for food. If there was a large litter and a “first come first served” dining process, then making a grab for any food becomes a habit. Any dog that has experienced hunger may have urgency when the scent of food is around. This may never fade completely and you will need to be diligent in practising good hand feeding techniques for life. We don’t want you to be worried about delivering treats or give the dog bad habits where food and hands are together. Take food from the bowl and scatter a few pieces on the ground. The smaller these pieces the better, we want to take the edge of the urgency for grab food. Pieces about the size of rice would be perfect. Once the first rush is passed, then offer food from your giving hand during the “oh, wow, that was good moment”, and before the “I want more ….” moment. We want the dogs with an urgency to take food to learn to trust the process and relax around food. Alternate between the scatter and the hand feed. Once you begin to get a stable result, hand feed more often than scatter, until scatter is only used in emergency situations. 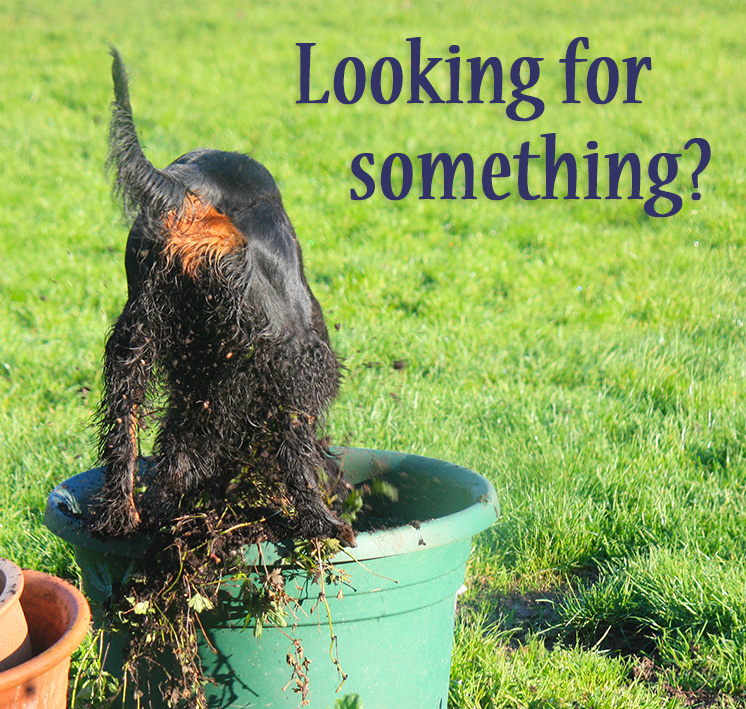 If the scent of food is very arousing, keep several food reserve pots out in places where the dog can smell them but cannot reach them. The top of the fridge is an excellent place, or the very back of a kitchen counter. Every now and then when your dog is not paying attention call him, walk calmly to the pot and practice the feeding exercise. Vary this between different pots – good for recall practice too! The dog will learn that feeding is a frequent process through the day, in association with people, and clear delivery patterns can set up a good lifetime habit. If you are training with a dog that is more than a little enthusiastic to eat finger as well as treats, you can employ a cup on a stick. This is a small measuring cup with one piece of food in the cup. We want to place the food to the floor, not let the dog take it from the cup. Avoid letting the dog grab the cup as well. When they are eating the piece on the floor, use the moment to load the next piece to the cup, make sure the dog knows there is food in the cup and again deliver to the floor. When the process reduces the enthusiasm for hands, you can begin to shorten the stick so that the hand gets closer to the cup. Eventually you will be able to hold the cup in your hand and deliver to the floor. This is a process familiar in training zoo and exotic animals where hand feeding could be dangerous, or that the tiger may be fearful of hands. Protective delivery. If you have experienced just how sharp those puppy teeth are you have probably given the pup treats with understandable caution. Unfortunately the cautious approach where you prepare to draw back can often cause the pup to lunge for the food before it disappears. Blend empty, cupped hands with cupped hands containing food. For the first few times you reach to the pup, or older dog’s face, just offer an empty hand to sniff, and perhaps add a gentle smooch to the underside of their muzzle. Repeat this a few times until it starts to look boring. Then mimic exactly the same action but with a piece of food in your cupped hand. I love my dogs to see the cupped, offering hand as an chance for something pleasureable: either a piece of food, or a moment to connect, or a chin rub. Open hands should always be without complication or threat and a signal to the dog to trust. It is always good practise to know exactly where your dog’s muzzle is, and reach to it. 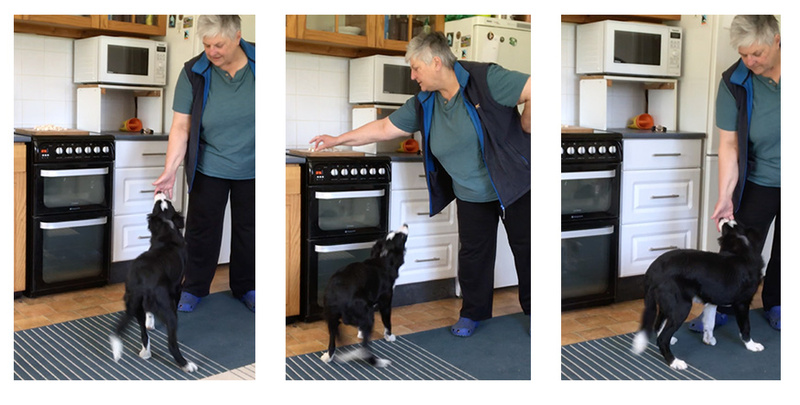 Lunging at food hands is taught to dogs by people. We want to teach the dog what to do, not make them worry about what they are doing wrong. Hands can have very specific language when they are used consistently. My hand palm up will encourage the pup to come towards that hand – because they have learned this is how to collect a treat, and probably get some affection as well. The hand palm towards the dog should be clear that it means “hold your position …. ohmygoodness …. food is at your feet!”. 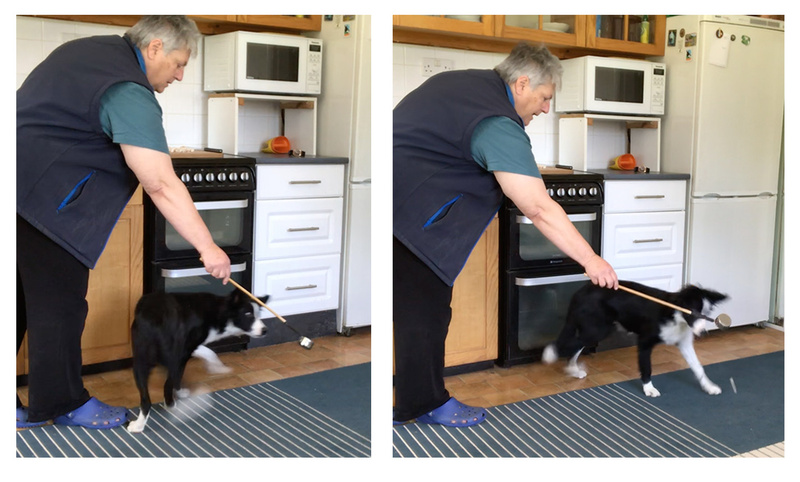 It teaches the pup what to do and because they hold their position food will arrive from the other hand to the floor. I open the car door – to block her from jumping into the driver’s seat, or jumping out of the rear. When the pup is reliable you can think about adding a word to this, but try not to choose “no”. “Block” or “hold” are good cues.